For the past 5 years or so, I have dealt almost exclusively with Holmans. As a master painter and decorator of some 25 years' standing, it has been essential to have a reliable and knowledgeable stockist of quality products, and HSP has been just that. Established in the 1980's by Colin Holman, HSP is now in the capable hands of Paul Hague who brings his own industry experience and team of specialists to this excellent organisation. Colour matching to a client's specification is one of the key requirements of my trade, and HSP are able to offer me 100% reliability in this regard. Specialist paint They stock my 'dream team' products for the perfect paint finish on my kitchens, ie Tikkurila Otex Adhesion Primer and the Tikurilla Primer and Topcoat paints. I would also like to add that the Tikkurila paint system is second to none in all the ways a decorator would expect. Holman Specialist Paints supply a range of the best high performance interior and exterior paints and coatings in the UK and Europe. Read Mark Nash’s review of Holmans, a company he has used almost exclusively over the past 5 years or so, to source the paint required for kitchen painting and high end decorating work. Holman Specialist Paints are taking this opportunity to talk direct to professional decorators and keen DIY about their company and the products they are really proud of. Please take advantage of this platform to interact with an innovative and industry-leading business. Ask Holmans questions about what you see and read here, and contribute any constructive comments about what they do well and what they could do better. 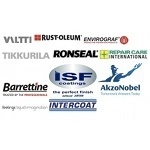 Holman Specialist Paints supply the highly regarded Tikkurila brand of durable interior and exterior coatings for woodwork and walls. Tikkurila formulates exterior coatings for the harsh conditions of Northern Europe where extremes of cold and heat demand a coating that is flexible, durable and retains its finish and colour for many years. The same approach to performance has been applied to coatings for interiors where the Company is renowned for supplying paints that meet and often exceed limits for VOC and particulate emissions. In fact, Tikkurila supplied some of the very first paints to be awarded the European Eco Label. The Tikkurila range of paints for wooden furniture, cabinets and trim is currently being used by many well known bespoke kitchen and furniture manufacturers throughout Europe. The products have been chosen not only for their exceptional abrasion and chip resistance, but also for their ease of use, application and drying characteristics. Tikkurila finishes are available in literally 1000’s of colours and also matched to any material, meaning that any shade is available to the home owner, architect, furniture maker, painter and kitchen manufacturer. Feelings Furniture Paint is water based low-odour, non-yellowing, waterborne acrylate latex finishing paint and dries to an abrasion and chip resistant satin matt finish. It is suitable for interior wood surfaces, furniture, cladding and mdf. It can be used on all types of wooden furniture, including items suitable for children’s rooms. It has excellent flow, is quick drying and will out perform most brush applied waterborne and solvent borne coatings for kitchen, bedroom and bathroom cabinets. Feelings Furniture Paint is available next day if required, in any colour of your choice. When redecorating previously painted or varnished kitchen cabinets and furniture, preparation is key and Otex Adhesion Primer provides the perfect surface for painting. It adheres to any clean surface including glass and hard plastics. Otex is a quick-drying, solvent-based coating and its high build, high obliterating finish allows for very quick de-nibbing. It has a matt sheen which has been used by some painters as a finishing coat in its own right. Apply by brush, roller or spray (thin with high quality white spirit). Tikkurila Otex can be coloured to any colour of your choice. A highly durable, very low odour waterborne emulsion that provides a very hard wearing, washable matt finish. It is commonly used in listed and important heritage buildings for its attractive soft matt finish. An additional benefit is that it can be provided in very dark colours, safe in the knowledge that the pigments will not rub off or calender from frequent rubbing. Feelings Interior paint is also available in any colour of your choice. Below find more commercials and videos on Youtube produced by Holmans, Tikkurila and private individuals. Best thing would be to give me your telephone number. I will call you to discuss and setup the right system for you. Currently there is no code set up for this, but it is something we are hoping to introduce in the near future. Until this is added to the website, you may prefer to place your order over the telephone to obtain the TP discount. Feelings Interior is a full matt, low odour, waterborne, acrylate latex paint for use on interior walls and ceilings. Feelings Interior Paint has exceptional resistance to washing, using mild non-abrasive cleaning materials. Examples of use: plaster, concrete, brick, building blocks and boards, MDF, wallpaper, etc. Feelings Interior Paint can be used for repainting interior surfaces previously coated with waterborne or alkyd paints. It is available in any choice of colour. been having trouble with their darker colours as the base is clear formulation? have you any thoughts on this recurring problem? I want to decorate exterior windows which have been decorated badly in the past. When they are rubbed down they will get mostly to bear wood. There was some rot which has been cut out and spliced with new soft wood. I propose rubbing back and giving timber one coat of wood hardener and then x2 OTEX and TIKKURILA VALTTI ULTRA as the top coat. I am trying to achieve 10 years not 5. This is a good system for paint, but the weakspot is the softwood splice which “may” forever let you down, unless there is some Repair Care involved in the repair? For professional 3rd-party opinions on any of the decorating products or suppliers mentioned on this site, ask one of these independent specialist decorators. They work day-in day-out with a lot of the products here.